Kitchen remodeling in Los Angeles may be very popular, but it is also one of the most labor-extensive home renovations that you can partake in. Before you begin, it is essential that you find the right professionals for the job. By hiring the right people, you can rest easy knowing that your renovation will run smoothly and will finish within the predicted time frame. Best of all, you will be left with a gorgeous new kitchen to work and eat in! The best way to add value to your home is by renovating and updating the rooms within it! If you have not yet done so, kitchen remodeling in Los Angeles is a popular place to start. The kitchen and bathrooms are the most important rooms in any house. There is nothing worse than an outdated, dirty, and dark kitchen or bathroom. If you are interested in adding value to your home, the kitchen is also a great place to begin because a kitchen renovation can drastically increase the value of your house. At Honest Plumbing & Rooter, we make it our mission to make sure you get your dream kitchen at an affordable price. Our remodeling service is fast, easy, and professional. As we are plumbing specialists with years of experience, we can assure you that the final product will be structurally sound and that all of your new plumbing will be efficient and well-put-together. We do not cut corners; we take pride in our craftsmanship. Make Your Kitchen Your Own! We absolutely love it when our customers have specific ideas about what they would like to see in their kitchen renovation. We work with you from the very beginning to ensure that your vision can become a reality. 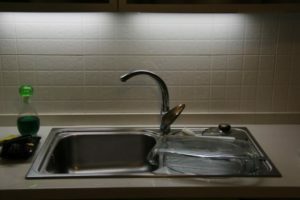 Kitchen remodeling in Los Angeles does not have to be a hassle! Unlike many other contractors, we will not leave you to eat fast food for months on end. We want to make sure that, from start to finish, we keep our clients up-to-date with our progress. It is our goal to make the renovation process simple for you, without causing you the stress that is so often associated with renovation projects. We know that it can be difficult living without a kitchen for a prolonged period of time. Without easy access to your appliances, you might be stuck getting take-out or delivery until we are finished. At Honest Plumbing & Rooter, we aim to limit the amount of time that you must spend without a kitchen, guaranteeing that you will instantly fall in love with your brand-new kitchen when the project is complete. Honest Plumbing & Rooter is a company that is defined by much more than just plumbing. We are plumbing specialists who offer a wide range of services. We tackle everything, from a leaky faucet to kitchen remodeling in Los Angeles. Best of all, we are a family owned and operated business with over 24 years of experience. When you work with us, you know that you are hiring a plumber or contractor that you can trust. We are family and we treat our customers right. Contact us today by calling (818) 840-8842 for your plumbing or contracting needs!